I want to stress that this is a personal article, between me and CDP, and doesn't necessarily reflect the views of all at RPS. At RPS we regularly argue between ourselves about matters of piracy and the like. They may agree with every word – no one's around just now to check. 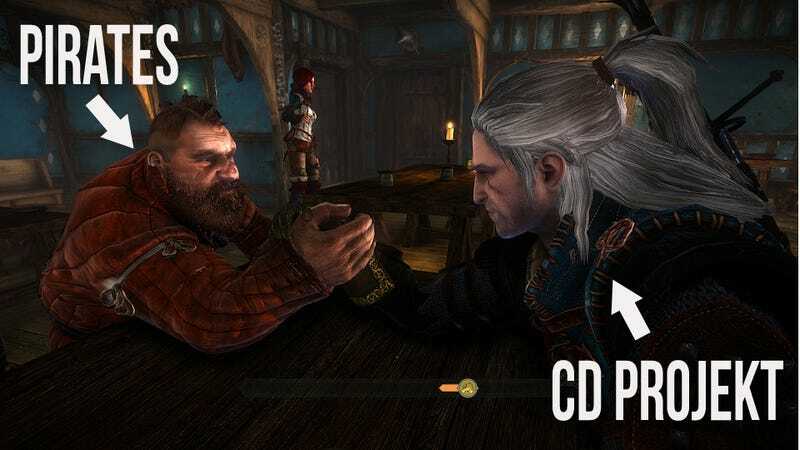 "As you know, we aren't huge fans of any sort of DRM here at CD Projekt RED. DRM itself is a pain for legal gamers – the same group of honest people who decided that our game was worth its price, and went and bought it. We don't want to make their lives more difficult by introducing annoying copy protection systems. Moreover, we always try to offer high value with our product – for example, enhancing the game with additional collectors' items such as soundtracks, making-of DVDs, books, walkthroughs, etc. We could introduce advanced copy protection systems which, unfortunately, punish legal customers as well. Instead we decided to give gamers some additional content with each game release, to make their experience complete. However, that shouldn't be confused with us giving a green light to piracy. We will never approve of it, since it doesn't only affect us but has a negative impact on the whole game industry. We've seen some of the concern online about our efforts to thwart piracy, and we can assure you that we only take legal actions against users who we are 100% sure have downloaded our game illegally." On whether such actions are merited – I feel that we are really trying to do a lot in terms of being pro-consumer ie. By removing the DRM experience for the users, delivering a lot of free extra content, etc. These people do repay us by being with us, and also by showing their support by means of paying for our games and allowing us to make new ones in the future. The purpose of this action is not to get rich on piracy – believe me, the numbers coming through as a result of this action are petty to say the most. We do hope, however, they may be a sort of deterrent for future pirates; maybe they cannot afford to buy the game here and now, but if they want it really bad, maybe they will consider buying it when the price drop happens as it always does for all titles eventually. It will not fix the world, as nothing ever will, but maybe it will stop some of the most notorious pirates from downloading our game and sharing it further. As for the more casual pirates I want to believe they will eventually become our legal customers because of how we try to work on our customer's satisfaction. As for the unauthorised duplication not counting as a lost sale – I guess this is not so simple really. I agree in some cases people just download "whatever" to have a look but would not buy otherwise, but there are also quite a few people who have financial means, have interest but feel that they should not pay becaue it is out there for free. It is this last group that is the most problematic, and I do not feel fine with this way of thinking, and we have never officialy supported this kind of behaviour. Being DRM-free is not a shout to all the folks out there – "hey, come and take our game – it's free." It is DRM-free, which means we really had to go through huge efforts with our publishers to make this happen so that people can enjoy the game without the hassle that pirated copies are already circumventing. Am I afraid this makes us look bad? I do not feel we are doing anything wrong, as long as people targeted are really 100% confirmed pirates. So far nothing has happened in the past couple of months that would indicate otherwise. The other thing is, the issue for me doesn't seem to be about inaccurate threats – those can be weeded out by the courts. It's about that they're *threats*. I realise you're not getting rich from this, but I'm also aware that if I had to part with a few hundred Euros, that wouldn't make your company rich, but it would cripple me on my low income. Do you accept that you're sending people demands for significant amounts of money, with the threat that if they don't pay up, they'll have to go to court for a great deal more? When crimes are committed, the usual practice is to go to the police, and then the criminal is arrested and eventually goes to court. Circumventing the process of law, by threatening people to buy their way out of a court case, strikes me as something pretty awful to do. This is why we appealed for your company to stop this, and I guess I'm repeating that appeal here. Many thanks – I really appreciate your time on this, and your patience with my stance." "When it comes to methodology, while I cannot share exact details, it does in its essence rely on IP identification, however, we do take into account individual cases. And once implication of innocence is reported and proven (ie. Someone actually bought a legal copy of the game but downloaded a torrent version for whatever reason), we may waive the claims. In fact, there was a single (one) case like that, and that person was not ultimately fined, and everything was fixed very quickly via email with no hassle for that person. So there is also case-by-case individual approach which does eliminate error as much as it is possible. Taking into account the fact that this action really does not target staggering amounts of people as some sources in the internet claim, such an individual approach is in fact possible. I can only restate – we have not been made aware so far of any case of the innocent person who would be targeted and made to pay the fee or taken to court. About threats – let me put it like this – when you get a speeding ticket or a ticket for causing a car crash or for any other felony – do you consider that a threat? Because it works pretty much in the same way. Maybe I am confused, but I do feel that not doing things that are wrong is a good way of staying out of trouble – there seems to be an implication that we are bad guys because we are trying to deter people who illegaly downloaded our game from doing that by means of this action. I am a little bit at a loss with this way of thinking. Especially since at the same time, we do take great pains, and even went to court to win the no-DRM case for the people, so that our customers can enjoy the game without any hassle. Also, I want to state clearly that this action is not circumventing the process of law as you are suggesting – this is actually a possible, fully legal action, allowed by the courts and state and regulated in a similar way as the speeding tickets are, for example. It beats me that, honestly speaking, we are being spoken badly about because we are trying to deter people from illegal access to our title. As for the question of other publishers – I am not at freedom to share the names of these publishers. I can only confirm I have spoken to some of them who are using the service and to developers who do the same, and I do not assume that they're taking similar action - I know this is the case. Why has our story been blown out of proportions? I do not know, but I do recognise this is a great to story to cover, and the only thing we can really do is to answer as honestly as we always do in everything that concerns our company and the games we make. Regarding Germany – it is about access to accurate data, which is allowed by the state. Regulations do not work in a similar way in all the EU countries. Germany does. The process would be possible in many other countries, but in some, the Davenport case would be likely to repeat itself. We cannot allow oursleves to target innocent people. This was never the intention and never will be. The moment we hear innocent people have been targeted, we will take immediate action." I want to applaud CDP for the amazingly open and frank way they have responded to this debate, even though I personally am extremely against their actions, and disappointed to see there is no sense of contrition or remorse about the devastating effects such actions can have on an individual. It is great that they are so passionate about ensuring errant accusations are quickly dealt with. And yes, of course piracy is a crime, and no, I am not defending piracy – that is not the point here whatsoever. But when the punishment is so disproportionate, and the efficacy is so ridiculous, I struggle to see any other way to interpret such actions beyond threats for money. Regarding the speeding ticket example – and clearly I'm speaking from the perspective of the UK, and don't know the details of the rules in Poland – they do not compare. If I am caught speeding, I receive a fine of £60, from the government. If I pay it within two weeks I pay only £30. I also receive three points on my driver's license. If I dispute the fine, I am allowed to challenge, and perhaps take the process to court to prove my innocence. That is not what is happening here. Here, this practice traditionally works by people receiving letters designed to scare them into paying an enormous sum, massively more than the cost of the game/film/CD they downloaded (usually justified by their also having uploaded, and therefore distributed the product – much easier to classify as a crime – but the fine in no explained way reflecting this). If they don't pay the sum, then they will be taken to court, and will have to pay a great deal more, they are told. Possibly tens or hundreds of thousands. We haven't seen a copy of the letters being sent out in Germany, and it's possible that they are worded very differently, but what they will be saying is, "Pay this large sum or you will have to pay a very much larger sum." Which is where those whiffs of blackmail appear. Even though, I very strongly stress, it is not. And this is why it looks like a cash grab, despite CDP's protestations that they aren't making serious money from this. (Although, let's be clear – if it is 1000 letters, and the fine is €750, that's still three quarters of a million Euro. I'm not so sure that's a figure to be so easily dismissed.) Because it only affects an insignificant minority of those who have pirated, it will only likely stop that 0.001% of pirates from doing it again, and then, only catch those who hear about the story, don't figure out the statistics, and get scared (a tiny minority). So no matter how accurate it may be (and the admission that there was one false accusation so far does rather knock down that "100% accuracy" previously claimed), it's still completely ineffective. Let alone the opportunistic appearance gained from only conducting this in Germany because individuals' privacy are already concerningly compromised. Oh, and one other thought. Regarding the statement that if someone had bought it, then torrented it after, they would let that go. Why, CDP, is that okay, but someone who torrents it, then buys it, is not? Which is to say, why not send these people letters demanding the €40 for the cost of the game? Since the person who torrents to replace his purchased copy will be uploading just as much as he who pirated before buying.